Friday was Ricky's birthday and, being the birthday boy, he got to choose the day's activities. We had a nice dinner out and went to a movie. Now, we haven't seen a movie in the theater in...several years. His work schedule is so crazy that we don't have much of an opportunity to go. But he took Friday off, so we went out to a show. And I almost dropped dead at the FORTY DOLLARS we spent for the movie and some snacks! 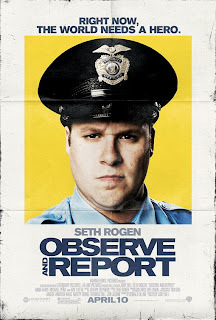 Anyway, his choice of movie was Observe and Report, the lastest Seth Rogen offering. I thought this movie would be the typical screwball comedy that one expects from Seth Rogen. I was fine with that; I was kind of in the mood for something silly, and I've always loved Rogen, since his days on the cancelled-too-soon Freaks and Geeks. What I got was something quite different. Observe and Report is NOT just a screwball comedy. Granted, parts of it did make me laugh hysterically. But the parts of it that are comedy are very DARK comedy. Halfway through, I realized that it was more of a comment on the mentally ill and their place in our society than anything else. It reminded me of some of my clients. It made me sad that, at least where I practice law, there isn't really a place for the mentally ill in the criminal justice system. Things are too black and white: if someone is competent to proceed, and if they were sane at the time of the offense, they are treated just like any other criminal defendant in the system, even if that's not the most appropriate way to handle their case. This movie did a very good job of pointing out the difficulties of life for those facing mental illness: the difficulties of obtaining (and maintaining) employment, the difficulties of engaging in romantic relationships, the difficulties of simply making it through the day, when you aren't exactly sure what is real and what is in your imagination. I didn't really like Seth Rogen's character. But I empathized with him and with his plight. He was at times quite violent, but the director did a good job of pointing out that it was his mental illness that caused the violence, along with a failure to understand his place in the world. I went in for a comedy and got so much more. Go see this movie. It was so much better than I expected it to be. It said so much more than I thought it could. I feel like I'm repeating myself a bit here, but, seriously, see it. 1. Apparently there's some sort of Twilight fan fiction brouhaha going on. 2. I love a sunny day but I also love rainy ones. 3. 2009 has been great so far. 4. I thought that was it. 5. For too long I've been putting off reading for other things. 6. I am not obsessed with work; I am not! 7. And as for the weekend, Friday night I'm looking forward to going to dinner and a movie with Ricky for his birthday, tomorrow my plans include a car wash and an oil change and Sunday, I want to spend some time on the couch with my book! Okay, the Read-a-Thon is officially over, I've had more hits on my blog than ever before, and I've read and blogged my little heart out, but there are a couple of loose, book-related ends that I still need to catch up on. First of all, I have been negligent when it comes to Mailbox Mondays. For a few weeks I wasn't getting anything, but last week I did get a Mooched book that I didn't mention. I Mooched and received Andre Norton's No Night Without Stars. This is some serious sci-fi right here. I haven't read much sci-fi, but that's something I'm looking to remedy. Also, last week I received, via LibraryThing (too tired to put in links...Google it, if you don't already have it bookmarked), Richard Currey's Fatal Light, a story about Currey's experiences in the Vietnam War. Not sure if it's more memoir, or just based on his time there, but this is a newly reissued printing on the book's twentieth anniversary. LibraryThing has been sending me a lot of war books lately...wonder why. These things seem to go in cycles, though. For a while it was cookbooks, then books about the Jewish experience during the Holocaust. So, to LibraryThing, I'm a cooking, Jewish war fanatic? HA! 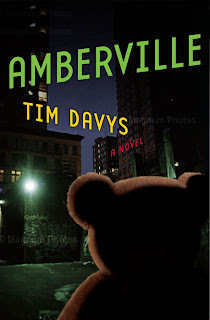 Finally, while reading through my new Bookmarks magazine, I came across a book that I've never heard of and am strangely fascinated by: Amberville by Tim Davys. It's rare that I peruse the pages of Bookmarks without having heard at least some buzz on my friends' blogs about a novel as innovative and, let's face it, downright strange-sounding as this one. Amberville is, and I am not kidding you about this, a teddy bear noir mystery. Yes, you heard me right...TEDDY BEAR NOIR. It is quite possibly the weirdest genre I've ever heard of and I WANT TO READ IT. I think I'm going to have to put everything on hold and go to the library to see if I can find this book. Have any of you read it yet? Has anyone even HEARD of it? It's getting pretty good reviews. Let me know if you know anything else about it, including who the mysterious Tim Davys might be. Edited to Add: Damn! My library doesn't have it! Guess I'll just have to keep a weather eye out for it. Oh, and Harper Collins? If you want to send me a copy? I'll drop everything to read and review it. Well, another one under my belt, huh? It's been so much fun again this time. Here's my final stats, and the official wrap-up meme. Amount of time spent reading since last update: One hour. Running total of time spent reading since you started: (keep track of this one to be eligible for a prize!) Eleven and a half hours. Other participants you’ve visited: Eva, Carl V., Anna and the Girl, debnance, Alaine, and Fantaghiro; BJ, Carrie at The Book Girl, Lissa at Lissa's Long Yarn, Lisa at Books Lists Life, Leslie at Life on the Shelves, and Karen Beth at The Pink Bookmark; Laza at Gimme More Books, Lynda at Lynda's Book Blog, Mary Beth at Boo's Bookshelf, mari at MariReads, MandaNikole at Literary Mumblings, and Peta at The Bookling; Tammy at Tammy's Book Nook, tanabata at In Spring It Is the Dawn, Valentina at Valentina's Room, Sandra at Fresh Ink Books, Reeder at Reeder's Corner, and Rebecca at Lost in Books. What I've eaten: Peanut M&M's; instant mashed potatoes (I don't know, the cupboards are pretty bare and I was carb-craving! ); Life Savers and more Diet Mountain Dew of course; chunky peanut butter and pretzels; Chik-Fil-A sammich and fries with my honey and more Life Savers; more Diet Mountain Dew; popcorn, more peanut M&M's. Eleven and a half hours??? That's like half of the really real Read-a-Thon! And 328 pages. Do you even KNOW how long it would take me to read that many pages in real life?! Awesome. I'm sure I'm nowhere near the top of the pack, but I'm proud of myself, even if I didn't quite make it into the Ya-Ya's. Ooh, I'd say Hour Sixteen. I had to take a nap. I highly, highly recommend a short story anthology. (Is it an anthology when it's by different authors? That's what I'm trying to say...) At least for my attention span, they really worked. More random prizes? Like just drawings for no reason? I found that the Mini-Challenges, while fun, distracted me from my reading, which for me was the main focus...I understand that the idea is to get away from the book for a while, but it would be nice for those of us who are more hard-core about the reading to be able to win prizes too. Pretty much everything. 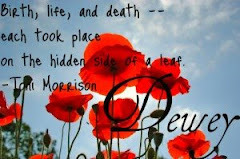 I am so grateful to Nymeth, Trish, and Hannah for carrying out Dewey's vision, even after she's gone. It was just as much fun as last time, when Dewey was in charge. And, of course, Dewey. Wherever you are, thank you for helping our little (HUGE?) blogging community come together to celebrate our love for reading. One book and one magazine. The Best American Short Stories 2008 and most of my newest Bookmarks magazine. The magazine, but it was good, too. Oh, I will absolutely be back next time. As a reader. Thanks to everyone who helped put this event together, who came by to cheer me on, who donated prizes....everything. It was freakin' AWESOME and a great testament to Dewey. Okay, I lost it. After my last post I read for about half an hour, took an hour nap, read for another half an hour and then went to bed. My head and eyes were hurting and my face felt like someone was pushing it into my brain (wellll, that was from allergies, but it was uncomfortable). Running total of time spent reading since you started: (keep track of this one to be eligible for a prize!) Ten and a half hours. Mini-challenges completed: Two...er, I think. I can't remember. BUT. BUT! Ricky had to get up and go to work this morning (shift work blows), so I'm up for the last hour of the Read-a-Thon. And I thought, well, hell, why don't I get up and do one more hour of reading, now that I've had six or seven hours of sleep? So I will...here goes nothing!!!! I think. I think it's Hour Sixteen. I've completely lost track at this point. But I'm having a bit of a second wind, so I think I can keep going. Ricky's due home from work at any time now, so that may make it more difficult for me to read (more distractions! ), but we'll see how much longer I can go. Amount of time spent reading since last update: Fifteen minutes? I was watching TV. Running total of time spent reading since you started: (keep track of this one to be eligible for a prize!) Nine and a half hours. Trying to make it to the Ya-Ya's! WOO HOO! Welcome to everyone who's still around and congratulations for sticking with it! What I've eaten: Peanut M&M's; instant mashed potatoes (I don't know, the cupboards are pretty bare and I was carb-craving! ); Life Savers and more Diet Mountain Dew of course; chunky peanut butter and pretzels; Chik-Fil-A sammich and fries with my honey and more Life Savers; more Diet Mountain Dew. Reading Bookmarks' May/June edition, trying to get new ideas for my already-ridiculously-long TBR list. One complete book and part of my magazine. I hope to have time (and stamina!) to still pick up The Divine Secrets of the Ya-Ya Sisterhood. Should be a nice, light read to go out on. I actually cancelled a jewelry party I was supposed to be hosting in order to do the Read-a-Thon. I mean, I've been waiting six months to do this again, how could I have other plans?! No real interruptions. The one or two I've had were actually welcome breaks from my reading. Hmmm, how many new faces I'm seeing? It's so great to find all these new book bloggers! Maybe add some graphic novels to my list, or some YA reading to keep it light. Reading short stories this time around worked surprisingly well. I'd recommend that for people (like me) with short attention spans. Also, take frequent breaks and invest in a LOT of caffeine. Having a great time! BUT House is on, and it's an episode I've never seen, so I'm giving my eyes a break. I might watch 48 Hours Mystery, too. I'm terribly addicted to that show. Keep it up, y'all! We're doing great! This series is one of my favorites. I've been collecting these short story compendiums since 1999. (Ten years, wow!) I used to buy them as soon as they came out, sometime in October of the year in question, but now I usually ask for them as a Christmas gift. In addition to the Short Stories collection, I also get the Mystery Stories and Non-Required Reading editions. I read most of this book during the Read-a-Thon, and I found it to be ideal for that situation. Instead of trolling through a long tome in one voice, by one author, I had the ability to read several snippets in different voices, yet each telling a complete story. These short stories really are the best of the best. The only one I didn't particularly care for was "Nawabdin Electrician" by Daniyal Mueenuddin. For some reason, Nawab didn't resonate with me. I didn't feel much when the story reached its climax, despite the action being intense! My favorite story was probably Steven Millhauser's "The Wizard of West Orange," a fictionalized (or is it?) telling of a Thomas Edison-esque (or maybe it was meant to be Edison? But he worked in Menlo Park...) inventor who came up with a machine, the haptograph, which could simulate touch, with astonishing results. Coming in second? "Vampires in the Lemon Grove" by Karen Russell. Unusual story about...um, vampires...living in a lemon grove. This collection of short stories was a great way to spend a good chunk of the Read-a-Thon. If you are in any way interested in adding really good quality short stories to your repertoire, by all means, check this book out! Five out of five Whatevers, as usual. The challenge this hour (these hours?) is to post about books which have been made into TV series or movies, books you WANT to see made into movies or TV series, and TV series and movies you would like to see in book form. Anne of Green Gables - loved the Kevin Sullivan adaptation, although I watched it BEFORE I read the book, and I remember being crushed about the parts of the mini-series that differed from the book. The second one wasn't as good, since it smushed together several of the sequels into one movie. I hear there's a third, but haven't seen it. Harry Potter - I haven't seen all of these, but the casting is great, and I think they are as true to the books as they can be in the time allotted to movies. Lord of the Rings - OF COURSE I love these movies. What more can I say? They were excellently done. Bridget Jones' Diary - although I'm not sure I'd pick Renee Zellweger to be Bridget. Was Four Weddings and a Funeral based on a book? If not, I'd like to read it in novel form. LOVE that movie. What about the new TV series Castle? Based on a thriller writer's need to create a new series, I think this would made great reading. That's all I can think of for now. Feel free to add your faves in the comments! Hour Twelve - The Halfway Point! Thanks so much to everyone who's stopped by to cheer me on! I probably won't be doing individual answers to your comments, but know that I have read each and every one and they are very motivating. Number of books read since you started: ONE BOOK COMPLETE!!!!!!! Mini-challenges completed: Just one, so far...maybe more on the way. What I've eaten: Peanut M&M's; instant mashed potatoes (I don't know, the cupboards are pretty bare and I was carb-craving! ); Life Savers and more Diet Mountain Dew of course; chunky peanut butter and pretzels; Chik-Fil-A sammich and fries with my honey and more Life Savers. The break to have dinner with Ricky was good. It reinvigorated me. Turned off the AC at this point and opened the windows back up. The fresh air is helping. Think I'm gonna browse through my new Bookmarks magazine for a while, to get a taste of something different. Oh, and look for a review of the book I finished, coming soon! Mini-challenges completed: Just did my first one, the Love Your Library Mini-Challenge! Other participants you’ve visited: Eva, Carl V., Anna and the Girl, debnance, Alaine, and Fantaghiro; BJ, Carrie at The Book Girl, Lissa at Lissa's Long Yarn, Lisa at Books Lists Life, Leslie at Life on the Shelves, and Karen Beth at The Pink Bookmark; Laza at Gimme More Books, Lynda at Lynda's Book Blog, Mary Beth at Boo's Bookshelf, mari at MariReads, MandaNikole at Literary Mumblings, and Peta at The Bookling. What I've eaten: Peanut M&M's; instant mashed potatoes (I don't know, the cupboards are pretty bare and I was carb-craving! ); Life Savers and more Diet Mountain Dew of course; chunky peanut butter and pretzels. I'm getting a bit tired, both physically and emotionally. I read a couple of short stories in the last two hours that made me cry. But I think I will be finishing up this book very soon and moving on to a magazine next, for something a little different. I'll also be taking a break in the next hour to take dinner to the Fiance', so that will help me take a mental break! Gonna go cruise some more blogs right quick, and then back to the books. Still going strong! Took a break from the recliner and moved to the bed; it brought back memories of childhood summers spent propped up on my arms, devouring whatever I brought home from the library. BUT I began to fall asleep, so I moved to the living room couch. It's starting to get a little hot here, so I'm debating about turning on the air conditioner. Other participants you’ve visited: Eva, Carl V., Anna and the Girl, debnance, Alaine, and Fantaghiro; BJ, Carrie at The Book Girl, Lissa at Lissa's Long Yarn, Lisa at Books Lists Life, Leslie at Life on the Shelves, and Karen Beth at The Pink Bookmark. What I've eaten: Peanut M&M's; instant mashed potatoes (I don't know, the cupboards are pretty bare and I was carb-craving! ); Life Savers and more Diet Mountain Dew of course. Gonna go visit a few more people and maybe take a shower to refresh myself (no, I haven't even gotten dressed yet today). Things are going well so far. I got to visit a bunch of new blogs and some cool people have stopped by and wished me well, too. Thanks guys! I haven't yet participated in any mini-challenges, but let's see what the rest of the day brings. Other participants you’ve visited: Eva, Carl V., Anna and the Girl, debnance, Alaine, and Fantaghiro...more soon to come! Where are you reading from today? Home, in my recliner, so far. 3 facts about me … I'm a lawyer, I have three cats, I'm getting married in a little over a month. How many books do you have in your TBR pile for the next 24 hours? Umm, a million? No, really. I've picked two books and one magazine, but the sky's the limit for me. Do you have any goals for the read-a-thon (i.e. number of books, number of pages, number of hours, or number of comments on blogs)? I'd like to finish the book I'm on and read a full magazine. If I could get two full books finished, I'd be VERY happy. If you’re a veteran read-a-thoner, Any advice for people doing this for the first time? Take breaks as needed. And ENJOY. It's supposed to be FUN, not WORK. Happy reading everyone! Dewey, this one's for you. Until the 24-Hour Read-a-Thon begins! I was quite a bit worried when I woke up this morning with a worse headache than I'd had yesterday (damn migraines), but after taking some Excedrin Migraine (the best drug ever invented), I am feeling good, and ready to do some damage to Mount TBR. What's on your plate for today? Any guesses on how long I'll make it? In October, I made it something like 17 hours, but then succumbed to sleep. Can I do all 24 hours today?! 1. Join me in laughing a little...it makes everything more bearable. 2. Put a little rum in your Coke! 3. Happiness is a warm bed and a good book. 5. I'm waiting for May 23rd. 7. And as for the weekend, tonight I'm looking forward to getting a lot of sleep, tomorrow my plans include 24-Hour Read-a-Thon!!! and Sunday, I want to catch back up on my sleep! I'm getting jazzed for the Read-a-Thon this weekend!!! I have to start putting my book list together and stock up on snacks and caffeine. What are your plans for Saturday? Are you reading, cheering, just observing? Booking Through Thursday...on a Sunday! Like I said, one book, plus a magazine. Not really. If I weren't reading a book of short stories, I'd probably finish the book first, then go on to the magazine. One thing at a time, or Lexi loses her sanity. Depends on where I'm reading. Coffee table in the living room, usually, or an end table. Sometimes on my nightstand, when I've been reading in bed. 1. Anonymous...should grow a set and post under his or her real name. 2. Work is a necessary evil. 3. Let me embrace thee, sour adversity, I'm a lawyer, for goodness' sake. 4. The smells of earth reawakening are what I look forward to most about Spring. 5. Who needs therapy when you have books?! 6. Any kind of chocolate at all MUST go into the Easter Basket! 7. And as for the weekend, tonight I'm looking forward to having our marriage license in hand, tomorrow my plans include getting an oil change and Sunday, I want to get back to my books and magazines! Did you mean by The Mill on the Floss?" I figured my fellow literary types would get the joke. Believe me when I say there WERE people in my literature class who didn't get it. Got my wedding dress today. Being an untraditional bride, I bought an apple-red bridesmaid's dress from David's Bridal. I really wanted an even more informal sundress-type gown, but I couldn't find exactly what I wanted in the color I wanted ANYWHERE. So I decided to just try on every short dress they had and picked the most flattering. It ended up being the first dress I found on their website that I really liked. Now I just need shoes and earrings. I have this coming Friday off for Good Friday, so I think Ricky and I will take a little trip down to the courthouse to sign the papers...May 23 is coming up faster than I can believe! 1. Angel or not, I will cut you down. 2. You can have me any way you want me. 4. I need to rest and read after I'm done working out or doing something strenuous. 5. Even in the most crowded of rooms I can catch Ricky's eye and laugh. 6. Always, trial docket is a day fraught with peril. 7. And as for the weekend, tonight I'm looking forward to drinks with my friends, tomorrow my plans include going "wedding dress" shopping and Sunday, I want to rest, read, and maybe eat steak!